In 2018 the turbos showed up and quickly start showing their ability to dominate. So in an attempt to keep the PXM class pure, PDRA has removed turbos as an option for the 2019 season. More than likely the turbos bikes will now attend Man Cup for the 2019 race season. Nitrous Oxide ONLY Power-Adder Allowed in Class. 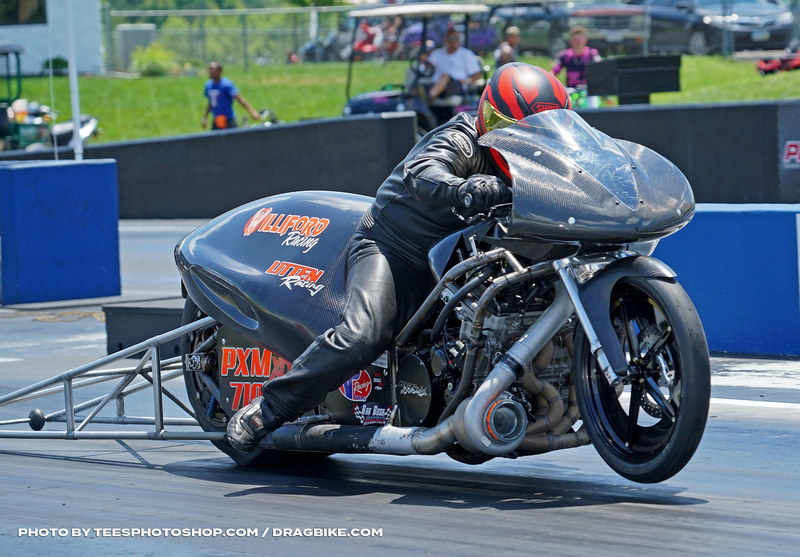 Pro Nitrous Motorcycle or PNM followed by bike number. Numbers must be at least 3” tall and on both sides of body or wheelie bars panels. PDRA Logo Decal and Class Sponsor Decal Required on both sides of vehicle where they are visible. Alternates receive ONLY 25 entry points. 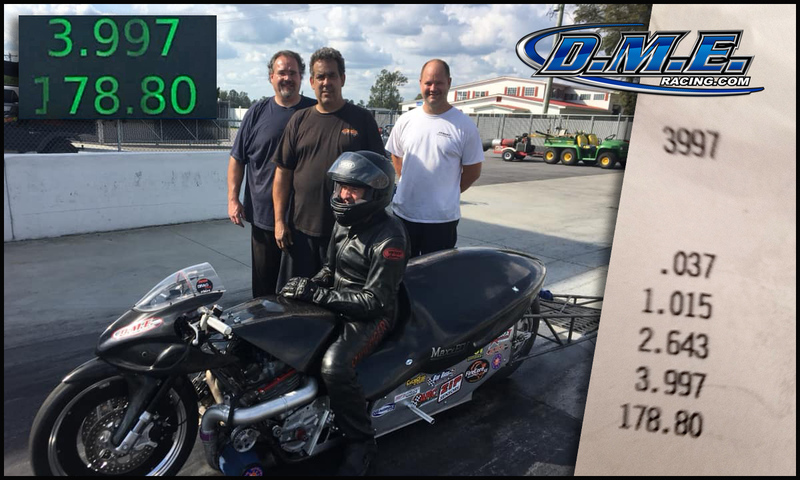 Motorcycle entries with 50 inches or less from centerline of crankshaft to centerline of rear wheel, must be stock stroke weight 595 lbs. All rules subject to change at the sole discretion of the PDRA Technical Services Department. APPEARANCE: All bikes must be professionally finished, painted, lettered, numbered and decaled. BODY: One piece body representing original manufacturers design. Full fairing, half fairing, headlight permitted. BATTERY: Must be securely fastened within the frame parameter. BRAKES: Front single 10” rotor or dual 8” rotors. Rear single 10” rotor. Must be fully operational when applied. FRAME: All Frame components except bracing and brackets should be constructed using a minimum of 1.00” x .058” 4130 chromemoly tubing unless the design has been submitted to the PDRA technical services department for approval prior to construction. This includes both upper and lower framerails back to the axle block as well as the box between the engine and the rear tire. GROUND CLEARANCE: Minimum 2” ground clearance with rider seated on the bike and no more than 10 lbs rear tire pressure. TIRES: Maximum tire width, regardless of temperature or wear, not to exceed 11” as measured with motorcycle off of the ground at 8 lbs of air pressure. Manufacturer, model and size information must be clearly designated. WHEEL BASE: Maximum wheelbase of 90”, Minimum wheelbase of 50”. WHEELIE BARS: Required. Non-metallic wheels required. WHEELS: Beadlock style rear wheel required. A flat shield must be incorporated into the front wheel and painted flat black. This shield should extend to at least 5 ½” above the ground. CHAIN GUARD: Must cover entire length and width of drive chain. Extended chain guard recommended. FUEL: Gasoline allowed. Nitromethane is strictly prohibited. INDUCTION: Mechanical fuel injection, electronic fuel injection or carburetors permitted. MAXIMUM ENGINE DISPLACEMENT: 1850 cc for inline 4 cylinders, 2640 cc maximum for V-Twins. TRANSMISSIONS: Auto Shifters Are Allowed. EXHAUST: All removable multi-piece exhaust collectors/stacks must be securely fastened with either an NHRA-accepted header tether, a minimum ½” (half-inch) stitch weld located on each primary tube or be permanently attached to the vehicle body or frame with positive fasteners (i.e. exhaust hangers, support brackets, bolts/nuts, etc.) such that they require tools for removal. CREDENTIALS: A valid competition license is required. A valid NHRA or IHRA competition license will be accepted and may be transferred when presented with a current physical. When an event is contest at an NHRA Member track only PDRA or NHRA competition licenses will be accepted. PUSH VEHICLES: Allowed. A valid driver’s license is required to operate any type of push vehicle. Posted pit speeds must be obeyed at all times. If pit speed is not posted, maximum pit speed will be 5 mph. CARBURETORS AND THROTTLE BODIES: Carburetor restraint / backfire strap is required. ENGINE CONTAINMENT SYSTEM: PDRA accepted engine containment system required. FIRE SYSTEM: Minimum .5 lb PDRA accepted fire suppression system required. FUEL LINES: Must use AN fitting or be fastened using metal clamp or tie wrap. HELMET: SN-2010 or newer, SFI 31.2 or 41.2 required. Use of open face helmet prohibited. Eject Helmet Removal System (Part # SDR 890-01-30) or equivalent required. KILL SWITCH: Required. Must be installed so that the rider can activate with both hands on the handle bars. Must use ignition cut-off switch securely attached to rider. Ignition, fuel pump and solenoids must deactivate. Lanyards must be constructed of leather, metal or nylon. Plastic lanyards prohibited. PROTECTIVE CLOTHING: Full leather suit required. If suit is two-piece it must attach using a full circumference zipper. The use of Synthetic suits are strictly prohibited. Full leather motorcycle boots required. Driving shoes prohibited. Boots must cover entire ankle. Full leather gloves required.